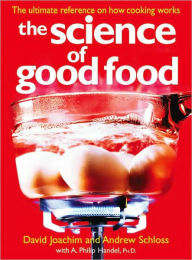 As a cook, I read Amazing (Mostly) Edible Science, and thought, this is a cookbook! Yum! However, having studied, researched and taught myself the hows and whys of cooking over the decades, I definitely understand that it IS a science. This is exactly why Amazing (Mostly) Edible Science by Andrew Schloss is such a fantastic book - it can hook people like me, who love food and cooking but not necessarily science, and teach me a thing or two. And have delicious, educational fun at the same time. 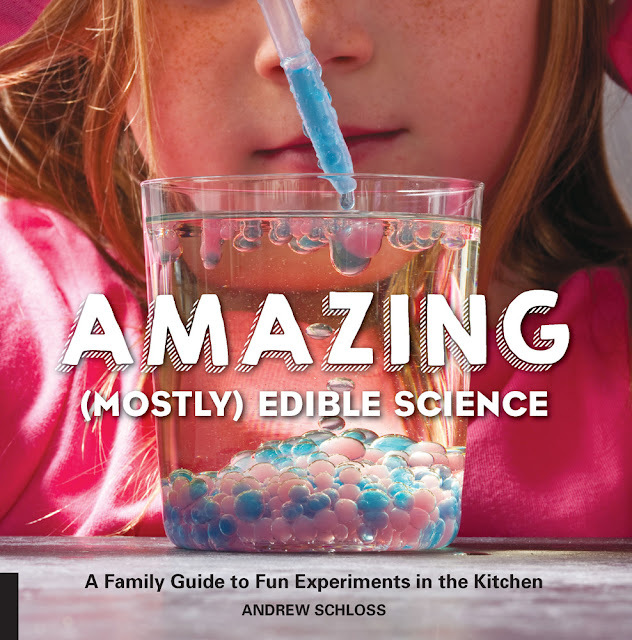 Andrew Schloss is an industry expert, chef, consultant, author and the co-author of The Science of Good Food, a book that brings restaurant level chemistry and physics home with explanations of the physical and chemical transformations which govern all food preparation and cooking, making him perfectly poised to write this superb book for kids. 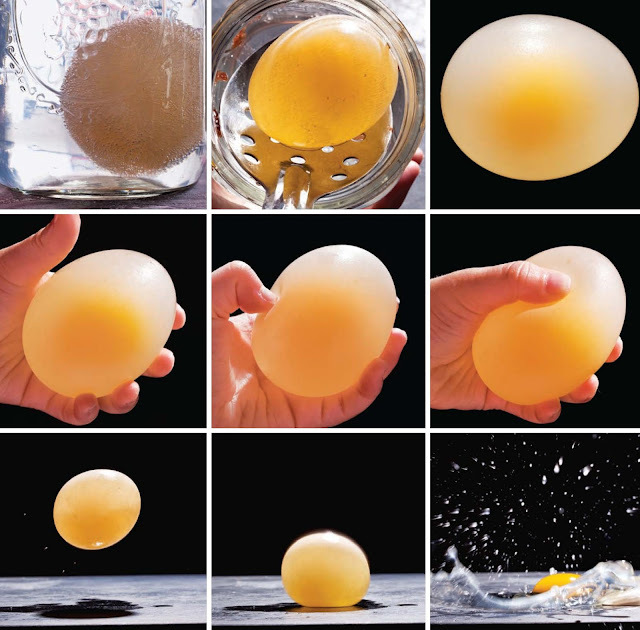 As I flipped through Amazing (Mostly) Edible Science, I came across many recipe experiments for things have long wanted to make. 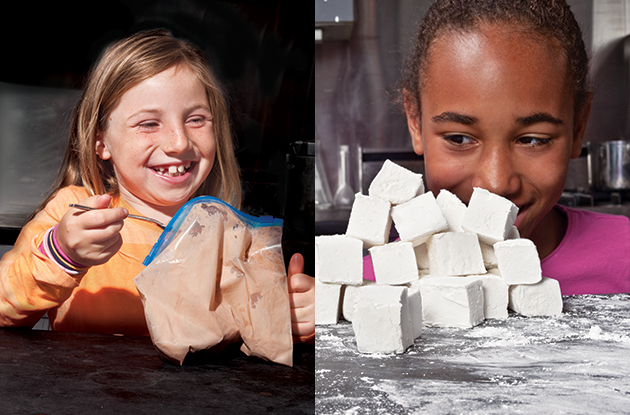 As the introduction says, "Each experiment is written directly to kids. Almost all can be completed with simple household ingredients. Most take less than an hour (some can be done in as little as 10 minutes), and each provides a snack or meal after you're finished experimenting." I can't think of a better way to spend time in the kitchen with your kids! Besides being filled with exciting experiments, the layout and presentation in Amazing (Mostly) Edible Science is MAGNIFICENT! Yes, it deserves that superlative in all caps. 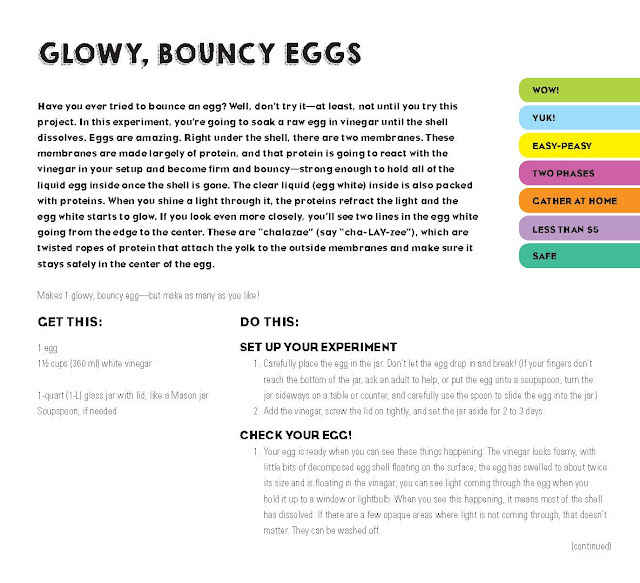 As you can see on the page below, each experiment has a rainbow-color-ranking on the right hand side of the page. Each color informs you as to the wow factor, the degree of edibleness, difficulty level, materials called for, time, cost and safety, making it SO EASY to flip through this book and choose something to do right then and there, or plan for another time. The table of contents is divided into six chapters: Wiggly, Jiggly Experiments, Sweet Crystal Experiments, Cookies, Cakes, and Other Baked Experiments, Fruitastic, Vegedacious Experiments, Eggcellent Eggsperiments, Sodalicious Experiments. You can make edible slime and glow-in-the-dark gelatin, cream-less ice cream and candy-cane origami. Or, you can make 40-second sponge cake, English muffins or molten chocolate cupcakes. As seen above, you can make glowy, bouncy eggs or solid soup. Then, top it off with little edible water bottles and milk rocks. As a cookbook and a science in the home book, Amazing (Mostly) Edible Science hits all the right marks for me. As a book lover, the aesthetics of Schloss's book is deeply pleasing, from the easy to read, colorful experiments to the fantastic photographs to the matte paper. This is a gorgeous, great book!